Shortly after 11 am Friday, August 26, Acting Chief Electoral Officer Craig James delivered HST vote results to the Speaker of the Legislative Assembly, the Clerk of the Assembly and the Attorney General. At 11:15 am, James released details to members of the news media waiting in the Press Gallery. With the exception of a few people at Elections BC sworn to secrecy, this was allegedly the first release of voting results to anyone. But, not really. Days ago, I wrote that Elections BC had provided the the vote outcome to the Liberal Government before Friday’s pageant. Indeed, Friday the Finance Minister admitted a transition team was already in place and a date chosen to reestablish PST. 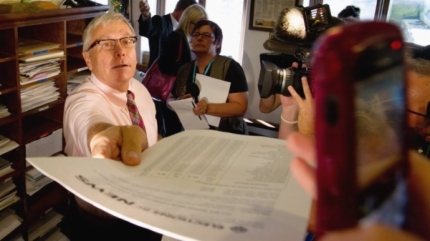 Additionally, negotiations on withdrawing from the HST had begun with Ottawa. Now, it seems that the vote result was circulated even more widely. Two hours after Craig James delivered results to the Speaker’s Office, rating agency Standard & Poor’s issued a bulletin. Because the bulletin reads like a press release from the BC Finance Ministry, it is a near certainty that Standard & Poor’s had advance notice of the results and had been briefed by the BC Government as to how effects of the tax change were to be played. 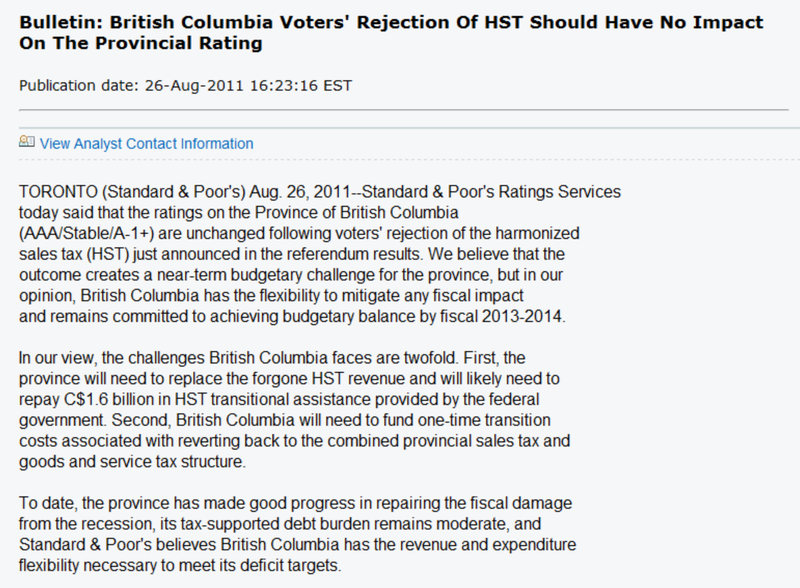 S&P refers to “forgone HST revenue” but there is uncertainty about that since BC was committed to dropping HST from 12% to 11% in 2012 with another 1% reduction to follow. The previous Liberal position had been that 12% HST was revenue neutral vis a vis PST so, if it relied on the public record, S&P could only be uncertain about the referendum resulting in tax losses. Standard & Poor’s has been accused before about shaping its opinions to suit political needs and I think it is appropriate to raise the accusation again. I also note that, despite statements of professional pollsters that the result was impossible to call, pundits usually favoured by Liberals predicted the result accurately, to within a few points of actual. Lucky or informed guesses? We should ask. Nothing good ever comes out of the BC Liberals. They are permitted to, lie, deceive and cheat the people at will. They even have their own private judicial system. A special prosecutor, is only a phone call away. Brain dead witnesses are tolerated. They have their own propaganda media machine. Craig James of Elections BC, worked for the BC Liberals. If Standard and Poor work for the BC Liberals. Why would we be surprised? Everything the BC Liberals touch, is sure to be contaminated. S & P is the fox guarding the hen house. Seems to me S&P is under investigation in the states for various questionable reporting matters. I am in full agreement with your article. It again shows how corrupt they are, and continue to do so. Beside them, Election BC, the mainstream media are guilty of unbalanced stories, and I believe that they also are directed by the PABsmears in Victoria. I am calling out the province and sun papers (I do not allow them into my home), and challenging them to grow some balls and not just lob easy questions to the lieberals, maybe some follow-up stories telling the truth for a change. If you want, call me sun / province, allow me some space in your rag. But, as I said they are cowards. Baldrey, Smart, B Good, and all the rest of you at NW, grow a pair. JUST TELL THE TRUTH!